Definition at line 133 of file app-layer-htp.h. Definition at line 134 of file app-layer-htp.h. Referenced by HtpConfigRestoreBackup(), HTPConfigure(), and HTPFreeConfig(). Definition at line 142 of file app-layer-htp.h. 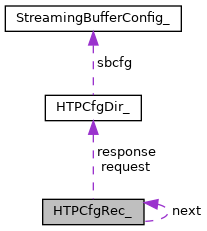 Referenced by DetectHttpClientBodyRegister(), and HTPFreeConfig(). Definition at line 135 of file app-layer-htp.h. Definition at line 140 of file app-layer-htp.h. Definition at line 141 of file app-layer-htp.h. Definition at line 149 of file app-layer-htp.h. Definition at line 150 of file app-layer-htp.h. Referenced by HtpBodyPrune(), HTPFileOpen(), and HTPFreeConfig(). Definition at line 147 of file app-layer-htp.h. Definition at line 145 of file app-layer-htp.h. Definition at line 146 of file app-layer-htp.h. Definition at line 144 of file app-layer-htp.h. Definition at line 137 of file app-layer-htp.h.